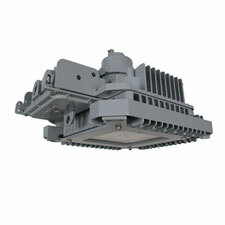 This unique to the industry, compact luminaire offers a quick-mount-pendant system which makes for faster and safer installations. Just pre-wire the mounting hood, line the arrows up, and lock into place— the need for a multi-person installation team disappears. As an alternative to our innovative quick mount, we offer an optional Y cable mounting kit. Simply attach 4 eyebolts and wire to the provided screw terminals in our field wiring compartment. Emerson understands that installing high bays can be costly and hazardous. High ceilings, restricted access, and pre-existing conduit installations can drive labor costs to 30% or more of total lighting project costs. Regardless of the facility and mounting style preferences, the Appleton™ Baymaster™ enables faster and safer lighting installations with its low weight, unique design, and flexible mounting options.